If you're new to the neighborhood, you might not recognize the Borders Building in its previous incarnation. The building has also housed the Sheridan Trust Bank (before it moved across the street) and the Loren Miller Department Store. Image courtesy Flicker. Click on photo for a larger view and more images by Mark 2400. 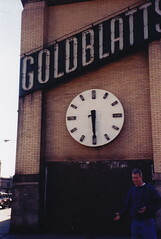 I had totally forgotten about the wonderful clock at Goldblatt's. We would arrive by L from Rogers Pk during the 50s and 60s to see the latest movies at the Uptown and Riviera theaters. In addition, a few years later, I recall the " Cheeta Club" at the Aragon. My parents have commented to me that during WWII, the Aragon was the hottest place on the north side. I wish they had been able to incorporate the clock into the new Borders design, but at least the building had a much needed face lift! My grandparents, great aunts and uncles all danced at the Aragon back in its heyday. Although the crowds have changed, it's still a fun place to hear music.